Underground Food Collective is back in New York City with a series of three multi-course dinners celebrating Spring Bounty and Foraged Foods, May 15, 17 and 18, 2009. After sold-out, highly praised Pre-Industrial Pig Dinners in January, Wisconsin’s celebrated Underground Food Collective is returning to Brooklyn. 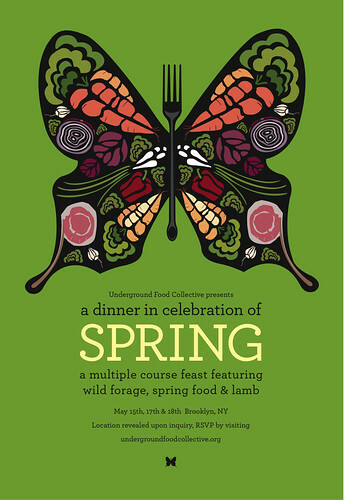 This time we’re joining up with local friends to present meals celebrating SPRING with local lamb, foraged roots and shoots (from Wild Organics), early harvests (from Added Value), and New York-brewed beer. Friends from Marlow and Daughters and Sweet Deliverance join us for dinners on rooftops, in scratch kitchens, and at urban farms. Dinners include a multi-course Spring Feast and tasty local beer. We encourage you to also bring a bottle of wine or other spirits to share with your companions. Tickets sold out fast in January, so don’t miss out on this exciting celebration. Please make sure to include your email address in your order, as we will email you with the location of the dinner once you purchase your ticket. All dinners are in Brooklyn.